Trea Bertie has left Racing Club Warwick to join Alvechurch. Racing Club Warwick boss Scott Easterlow has a player lined up to replace Trea Bertie but looks set for a waiting game before he can land him. 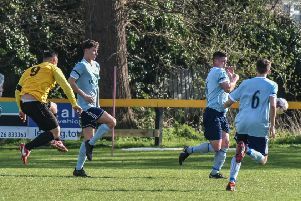 Bertie left Townsend Meadow to join Alvechurch late last week after Racers waived the seven days and made his debut for the Evo-Stik South Premier Central outfit in their 2-0 defeat to Coalville on Saturday. It continues a dramatic rise for the pacy frontman who only joined Racing Club from Smithswood Firs in January. However, Easterlow said he always knew Bertie, who scored five times in his final two games for the club, was destined for bigger and better things and has already scouted a potential replacement. “Trea is a loss but he goes with everyone’s best wishes from the club,” said Easterlow. “I got him from two divisions lower than us and after a short spell in which I believe he has improved massively he’s now gone to the Evo-Stik League, we just can’t compete financially with clubs like that. “I spoke to Trea after he played on Saturday and he knows if it doesn’t work out we will welcome him back. “Truth be known I was keeping the wolf from the door at the end of last season. “He was always going to move on at some point, the only disappointment for me was once he signed this summer I thought we might have kept him a bit longer. Despite the approach, however, Easterlow does not expect to be able to bring the player in before Saturday’s FA Cup clash at Malvern Town.